Located nearly 1000 km off the coast of Ecuador, the Galápagos Islands consist of 18 main islands forming an archipelago in the Pacific Ocean. Like most students, I grew up learning about the Galápagos and the H.M.S. Beagle’s exploration of the islands that eventually led to Charles Darwin’s theory of natural selection. Where evolution was first discovered, Peter and Rosemary Grant have continued Darwin’s research by tracking the evolution of finches in the archipelago since 1973. 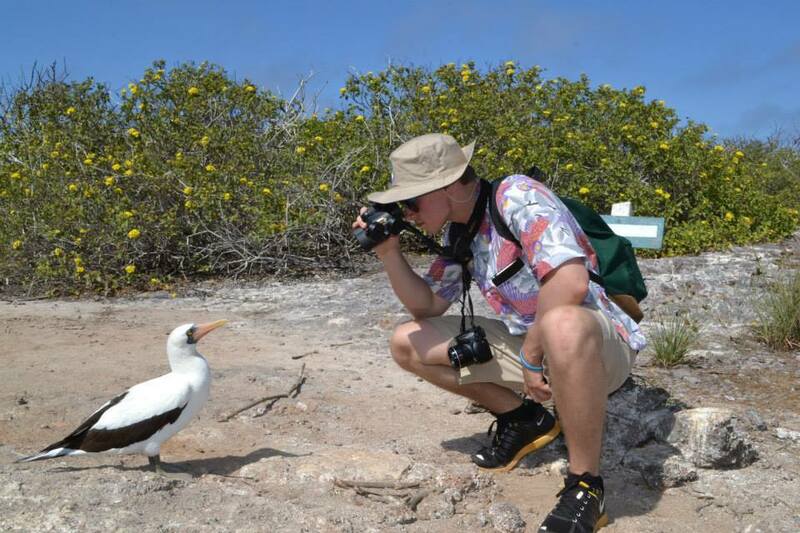 In June 2013, I too had the opportunity to travel to the Galápagos Islands to witness firsthand the wonders of evolution. Breeding. Galápagos Hawks are highly territorial; their behaviour leads to unique breeding characteristics. Hawks maintain territories year-round against all intruders, including juveniles and non-breeding adults (de Vries, 1989). As a result of the year-round territoriality behaviour, the territories do not change much from season to season or from year to year. Territories are controlled by a single female and up to four male hawks by the means of polyandrous behaviour. In the polyandry of Galápagos Hawks, cooperative breeding is practiced in order to increase the survivability of nestlings. Males will help raise the nestlings by hunting and retrieving food for both the female and the chicks, as well as fending off any intruders to the territory. Stacey and Koenig (1990) believe that polyandric behaviour has evolved in the Galápagos Hawk to compensate for the critical need for territory, increase the ability to breed, and extend breeding over a longer period of time. On Española, the Galápagos Hawk does not exhibit polyandric breeding behaviour (Lopez, 2013). Within each group of hawks, the number of males generally remains the same over long periods. After a territorial female dies, the males remain together and find a new female, while never allowing a new male into the group. Galápagos Hawk breeding is also very dependent on climate. During dry years, few groups of hawks may breed, while during wet years, nearly all groups are seen to breed (Stacey and Koenig, 1990). My experience on the islands was something I will never forget. Living on a private boat for a week, I ventured to nine islands in the archipelago and swam with more animals than I could count. Marine iguanas, land iguanas, Galápagos tortoises, blue and red-footed boobies, sea lions, frigate birds, and Sally Lightfoot crabs were all prevalent. Perhaps the most exciting animals to swim with were the scores of Galápagos penguins or hundreds of sea turtles we saw. Through the on-site field observations, each student on the trip was able to share useful information about different areas of expertise. Our Galápagos Conservancy guides offered to us valuable knowledge that allowed for more comprehensive understandings of the archipelago, as well as facts and accounts that could not be found in academic journals.